Bask in the richness of this serum infused with Rose Distillate known for it's skin softening and cooling properties, and enjoy the subtle calming scent of roses in the breeze. 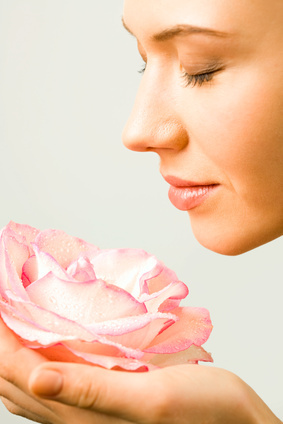 Also known as “Rose Hydrosol”, it is derived from the condensed steam produced during distillation of rose essential oil. Rose distillate is rich in water-soluble compounds beneficial for skin, especially sensitive skin types, helping to harmonize and balance skin functions. This penetrating serum is becoming a fast favorite among our customers based on this result driven formulas ability to help visibly improve tone, elasticity and the complexion overall by restoring skin to a more youthful appearance. Excellent for improving the appearance of ruddy complexions, puffiness around the eyes and dark under eye circles. Our key ingredients DMAE, Hyaluronic Acid and Coenzyme Q10 combined with Alpha Lipoic Acid assist with allowing the essential nutrients to penetrate deep within the surface of the skin, minimizing the look of fine lines and wrinkles. This provides age defying benefits which help support skin against further loss of moisture and aids in fighting against damage caused by free radicals. There will be a noticeable improvement in skin quality through cumulative effects creating a look and feel of firmness and vitality. DMAE ~ Provides support for skin health and is produced naturally in our bodies, and gradually declines as we mature. DMAE is shown to be a well tolerated skin firming agent. Women noted cumulative skin toning benefits with continued use on their neck, and around their mouth and eyes. Skin looks and feels firmer! Hyaluronic Acid ~ It penetrates deeply into the skin, boosting hydration and elasticity. It also protects the skin from free radical damage caused by exposure to the sun which creates sun spots through oxygenation of membrane cells. It assists with maintaining a high level of moisture against the skin for a plumper appearance. Coenzyme Q10 ~ When supplementing this topically, it protects the skin from oxidation caused by free radicals. The appearance of fine lines and wrinkles improve with the cumulative effects of this ingredient. It acts as an antioxidant and prevents chain reaction oxidation of molecules. Natural Fruit Acids ~ This unique blend helps to gently eliminate dead skin cells through cumulative use. Our fruit extracts are so gentle they will not cause that stinging sensation which can occur with higher concentrations of AHA’s such as Glycolic Acid. Leaves skin refreshed and toned, without flaking or feeling dry due to their moisturizing properties as well. Antioxidants ~ Designed to improve the appearance of fine lines and wrinkles, and to give skin a more even appearance. They are also perfect for fighting the damaging effects of free radicals caused by environmental pollutants and sun exposure. Combining nature with science using these vital ingredients creates a synergetic blend of a highly effective serum. Your skin will be left feeling smooth, supple, cooled and soothed, and it will absorb quickly without any greasy after feel. This Serum works in tandem with your favorite skin cream when used prior to its’ application for better enhancement for increasing age defying results. If you have hypersensitive skin, the gentle fruit acids may still cause a stinging effect to the face. Use sparingly and limit its use!